The scope and stunning effect that glass has within architectural design never fails to attract attention and admiration. It is inspiring to look at concepts that have emerged from drawing board, computer screen and huge automated machines to create a vivid statement that work with nature. Processors play such a large part in that process as the techniques of screen printing and shaping glass are applied to some of the world’s most striking building designs. Pretty much every top flight hotel will have logos, patterns or even information etched onto glass surfaces, adding a visual that is meant to be remembered. Clean and bold glass designs seem to add that touch of luxury needed for relaxing. One of the most striking modern designs where glass is the dominating aspect to the building can be found in the Freycinet National Park in Australia. Panoramic views of the Great Oyster Bay can be found in secluded cabins, which have glass as their focal feature. Described as an ‘immersive accommodation experience’ the Coastal Pavilion lodges allow visitors to immerse themselves in the surrounding nature whilst enjoying the ultimate in elegance and luxury. 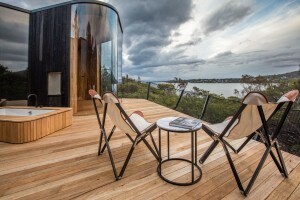 The latest lodges are stunningly designed glass pods that have been created by Liminal Studio which give enviable views over the bay or water views through the trees to the shoreline. The concept of merging nature and home is now not a new one, with bi-fold doors giving many the option to open up their houses to savour the beauty of the garden at the right time of year. This project takes things to a whole new level. The nine Freycinet Lodges comprise undulating glass walls on the exterior to create the feeling of being part of the bay that surrounds the area. Glass and wood curve around each other to create the ultimate in luxurious surroundings. The surrounding landscape has been the inspiration for the architects with curves dominating the entire structure. With eco-friendly focus all part of the minimalist design, every aspect of the lodges including huge showers with heated floor tiles, is glass walled enabling visitors to very much feel a part of the whole natural landscape and any intrigued animal wildlife that may be in the vicinity. The properties and types of glass will undoubtedly continue to be adapted to the changing needs of the market and the demands from consumers looking for greater thermal performance, more security and added luxury. As a material it is light and easy to handle but offers so much as a structural component and cladding option to make structures such as the delicate looking walls on Freycinet Lodges the very best in terms of luxury and security.